Carl Neill isn’t done with awards and titles yet. 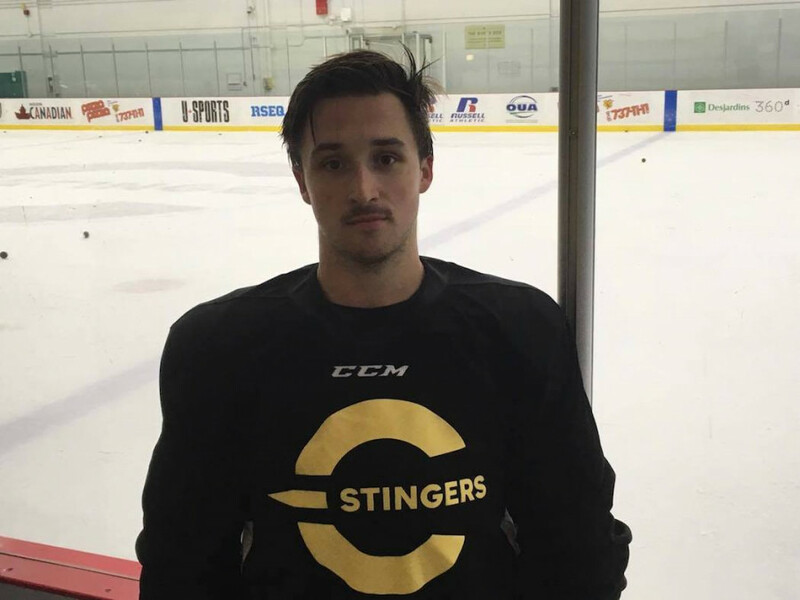 After a strong rookie season of U Sports hockey, the Stingers’ top defender was awarded the Guy Lafleur Award of Excellence. The award, along with a three year, $6000 scholarship, is given out annually to a university player that combines strong on-ice play with academic success. It is presented by the Montreal Canadiens and Guy Lafleur, the franchise’s all time leading scorer and five-time Stanley Cup champion. Neill was caught by surprise when his name was called at the Bell Centre Tuesday morning. “I didn’t know until they announced it, it was kept a secret. I had no idea,” said Neill. It wasn’t too much of a shock to those that saw Neill play this season. In his first season of university hockey, the former Vancouver Canucks draft pick scored 31 points in 28 games, leading the country in scoring, by a defenseman. His play earned him spots on the OUA East all-rookie and first all star teams as well as the U Sports all-rookie team. He also maintained a 3.06 GPA while making his mark on the league. 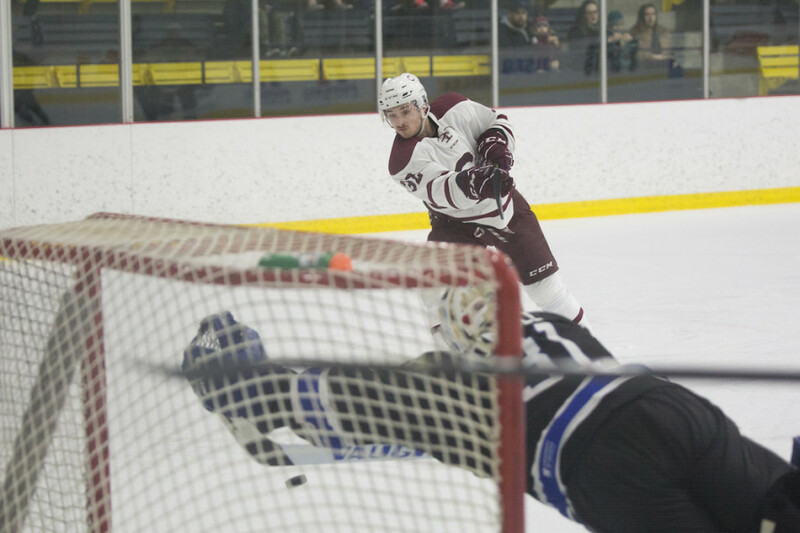 He credits taking several university courses in Prince Edward Island at the end of his junior career as a big help with getting accustomed to the university lifestyle. According to Neill, these accomplishments can’t be placed solely on his shoulders. The award is a reminder of the people that helped him get where he is. As proud as Neill is of the honour, he’s just as happy about how it reflects on his school and its hockey program. He’s got plenty of praise for those around him. Those people think he deserves a little more credit than he’s giving himself. “He’s done really good in hockey and in school, he deserves everything. I can’t take credit for that,” said Stingers head coach Marc-Andre Élement. Neill’s coach made sure to praise the young defenseman’s work off the ice, something that played into winning the award. Neill has been volunteering at Laurentian Regional High School, helping train young players and run hockey clinics. It was where he spent his high school years, just like his parents and uncles. “I’ve got a lot of roots out there so it’s nice to be able to give back a bit,” said Neill of his volunteer work. This kind of work definitely caught the eye of Concordia’s coaching staff. This offseason they announced that Neill would be named an assistant captain for the upcoming season, a position usually filled by older players. The Lachute native sees the new A stitched on his jersey as a chance to prove his loyalty. “It shows the staff have a lot of faith in me so it’s up to me to prove they made the right decision in giving me an ‘A’,” said Neill. For Élement, it was an easy decision to give his star defenseman a letter. The coach praised Neill’s leadership and ability, noting that he was particularly impressed with the fact that it came at such a young age. “He’s gonna be the team captain of our program [soon],” said Élement.